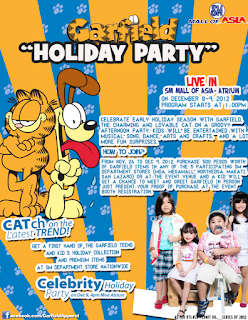 Garfield’s having a groovy holiday party not just for one but for all! Yes! You heard that right! We are inviting everybody to the two-day Garfield Holiday Party happening at the Mall of Asia Arena on December 8, 2012 from 1 PM to 4 PM and on December 9, 2012 from 1 PM to 5 PM. Garfield is an orange, fuzzy, tabby cynical cat who was born on June 19, 1978 in an Italian restaurant. He is obsessed with lasagna, coffee, and his remote control. In addition to that, he loves his nerdy owner Jon Arbuckle, the lovable dog Odie, and his girlfriend Arlene. Initially, the humorous comic strip that was created by mastermind Jim Davis was published in just 41 newspapers but it didn’t take long before it became a worldwide sensation turning into the most widely syndicated comics ever. As of recent, it appears in over 2750 newspapers and is read by 263,000,000 people all across the globe. Not long after, an animated TV Show entitled “Garfield & Friends” aired on CBS-TV from 1988 to 1995. Then followed the feature films Garfield: The Movie and Garfield: A Tail of Two Kitties Because of its undying success and marketability, it is only natural that Garfield has sellable merchandise. Over the years, it has sustained it’s own clothing line while at the same has done collaborations with major retail companies such as The Hundreds, a 2-part lifestyle project that houses both a clothing line and an online-magazine as well as Terranova, an Italian fast fashion brand. This year Garfield will be hosting a fancy tea party for the kids. Loads of fun surprises are in stored that all kids are sure to enjoy! Their imaginations will definitely run wild with our arts and crafts activities. We have also prepared lots of games with exciting prizes. And of course a tea party won’t be complete without something to munch on! The highlight of the event is the fashion show where we would be showcasing our latest Holiday collection. Expect lots of vibrant, colorful, and trendy pieces that are sure to brighten up any kid’s wardrobe. Of course these are not only stylish but also comfortable, easy to mix and match, and incredibly affordable. Something else to look forward to is the Teen's Collection launch that is filled with that great spunky cattitude Garfield is known for. This just goes to prove that Garfield is really one cool cat to be hanging around with the big kids. You and your child can score passes to this awesome event by simply purchasing Php 500 worth of Garfield Apparel Philippines items from any of the 5 participating SM Malls (Mall of Asia, Megamall, North Edsa, Makati or San Lazaro) or at the venue itself. One receipt entitles one pass for one kid and one of his/her parents or guardians. Good time are certainly ahead at the Garfield Holiday Party!